Ever wonder why you can brush your teeth every morning but can’t get that one email out the door or lose those pesky 5 pounds? 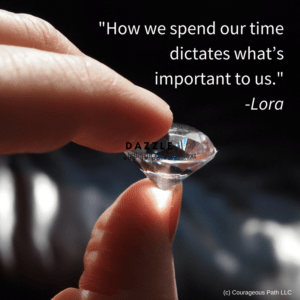 We focus on the big outcome instead of the little things. We easily react in fury and anger when our significant other doesn’t do something for us. Yet, at the same time, do we tell them what makes us happy? Do you ask your significant other for what you want on a weekly or monthly basis? Maybe it’s as simple as a take out meal once a month so you don’t have to cook. But, then you blow up at your significant other for never doing anything for you. Yet, you never asked for what you want. How does this translate at work? Your projects are boring. It’s the same monotonous project every single time. Your boss thinks you love it as you nail the project on time, and in budget each time. Yet, you’re drowning in boredom. You want to pull your hair out. All you want is a project that is challenging, new, and fun. Yet, you never ask for it. At the end of the year, you realized you gained 20 lbs out of boredom and can’t figure out why. It’s the little things you do each day that turn you into the person you want to become and create the reality you want. We get frustrated at the bigger outcome but don’t realize it’s what we do every day that leads to the bigger outcome. 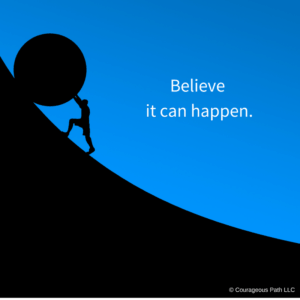 Do you have a big dream but can’t make any strides on moving it forward? You may doubt yourself. You may be afraid to fail. You may wonder if it’s really worth the time and effort even though it makes your heart sing. But, the big question is – Do you let others know what your dream is, how to support you or do you keep it all to yourself thinking it will magically happen? When you tell people, the world, what you want, the universe will conspire to make it happen. Are you willing to make small steps each day towards what you really want? Will you make this a habit just like you brush your teeth everyday? 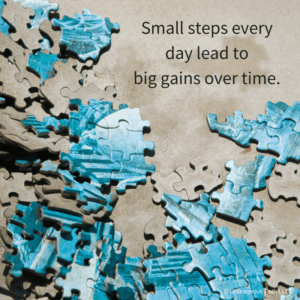 Small steps every day lead to big gains over time. Imagine how an hour a day on a specific project will progress with 365 hours over the course of a year. It will advance you immensely. The dark winter nights are erupting into beautiful warm spring days. The first 3 months of 2018 have come to a close. This chapter is done. The big questions is, Where are you now compared to January 1, 2018? Are you still in the rat race and going through the motions? Or, have you made noticeable progress? Have you even taken the time to notice? Yes, this is a hard conversation to have. The cool part is – you only have to do this with yourself. When I did this last year, I had to make some tough decisions. I had to identify where my time was spent and if my time was spent on activities that were meaningful to me. Upon this assessment, I realized I spent too much time serving on too many non-profit leadership boards. I also recognized I had gaps in knowledge for my business. While difficult, this reprioritization freed up significant time to focus on what I love versus giving for the sake of giving and draining myself in the process. What’s working well in your life, career, and relationships right now? What habits can you change? Who do you need to become to make this happen? Spring is about removing the weeds before they overtake your garden. If you’ve ever pulled up a dandelion weed, you know how deep the root is. It’s not about trimming off the top. Old habits are deep rooted. Cut off the root and the whole weed dies. How does this translate into real life? Where do you need to declutter? A messy office. A disorganized closet. Old stuff you’re keeping around that you haven’t used for years? Too many projects? 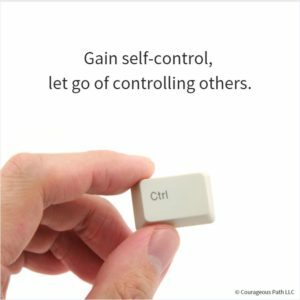 By eliminating what’s no longer wanted, you can create the open space you want to thrive and attract opportunities that do serve you. What do you want to nourish, grow, and flourish? On June 30, 2018, I want you to have a different story. I want you to thrive. I want you to grow and expand your capabilities. 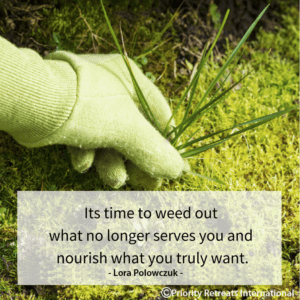 It’s spring and it’s time to weed out what no longer serves you and instead nourish what you truly want.